I grew up learning te reo through whānau, kohanga reo and Kura Kaupapa Māori. I chose to study education to give children the same opportunities I was given. I decided on this programme because the curriculum works together with the New Zealand Curriculum but has a specialisation in Te Reo Māori. The best part so far has been learning to become an effective teacher within a Kaupapa Māori-based environment. The faculty staff of Te Huarahi Māori and the student support services for Māori, such as Te Korowai Atawhai, have been a huge help to me. Because English is my second language, I had no idea what academic English was when I first began and I started to doubt if I could make it through the first semester. With the help of these special people at the faculty, I was able to surpass my own expectations in English and in Māori. One aspect that I hold dear to me is the marae on campus. Holding pōwhiri and being given the chance to speak keeps my relationship with my culture and tikanga intact. Living in a multicultural super city like Auckland and having a place like this helps me connect back home to the East Coast. 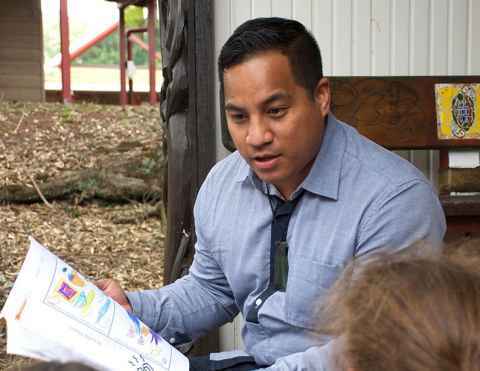 After graduating I have opened my own Te Reo Māori unit at Mangere Bridge School and in the future, I’d like to work towards becoming a Principal.